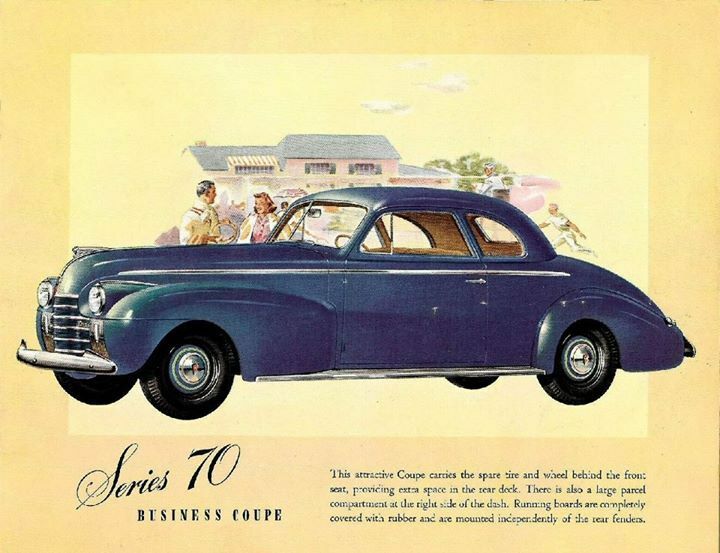 From a Pinterest site a picture of an advertisement for the 1940 Oldsmobile Series 70 Business Coupe. “Business Coupe” was a term for a two-door car that either had no back seat or one that was removable. These were designed for traveling salesman who needed room to carry samples in their vehicle, hence the name “business coupe,” but since they were generally less expensive than cars with four (or more) seats, they appealed to budget conscious car buyers, as well. Somewhat ironically, this “throwback” car actually represented a great leap forward in automotive history. For the 1940 model year, Oldsmobile offered the first truly automatic transmission, the Hydra Matic, which had been jointly developed by Oldsmobile and Cadillac. (Cadillac began offering the Hydra Matic on its 1941 model year cars.) This article from ateupwithmotor.com does an excellent job in chronicling the development of the Hydra Matic. The website author, Aaron Severson, wrote, “GM’s original Hydra-Matic transmission was one of the most important innovations in the history of the automobile. It wasn’t the first automatic transmission, but it was the first one that really worked and its resounding commercial success paved the way for every subsequent auto-shifter.” I think Severson actually undersells the quantum leap the Hydra Matic represented. It was a four-speed fully automatic and clutch-less transmission whereas virtually all previous cars had used two-speed or three-speed manual transmissions. Severson also wrote, “In 2010, Ferrari raised the hackles of automotive purists with the announcement that it would shortly phase out its conventional manual transmissions in favor of F1-style sequential gearboxes. The announcement gave new fuel to an old debate: whether a conventional manual transmission and separate clutch pedal are fundamentally obsolete. Outside of a small contingent of enthusiasts and professional drivers, the automotive world has long regarded the manual gearbox as at best a necessary evil.” I think many auto enthusiasts would disagree with that last sentence, but as you know if you are a regular reader, I agree wholeheartedly. All hail the 1940 Oldsmobile! For some more awesome throwback cars, check this out.